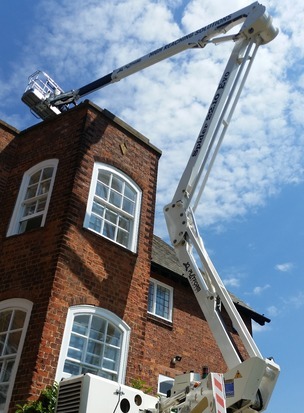 Selina, High Reaching Solutions Platform Basket 22.10 EVO Hybrid tracked spider cherry picker, was requested to assist with chimney inspections and repairs at various properties around York. 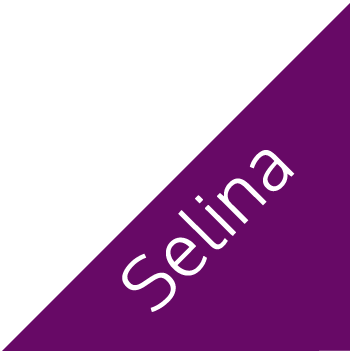 Our clients own staff as well as their subcontracted chimney sweep, Trevor Lund, were very impressed with Selinas abilities. 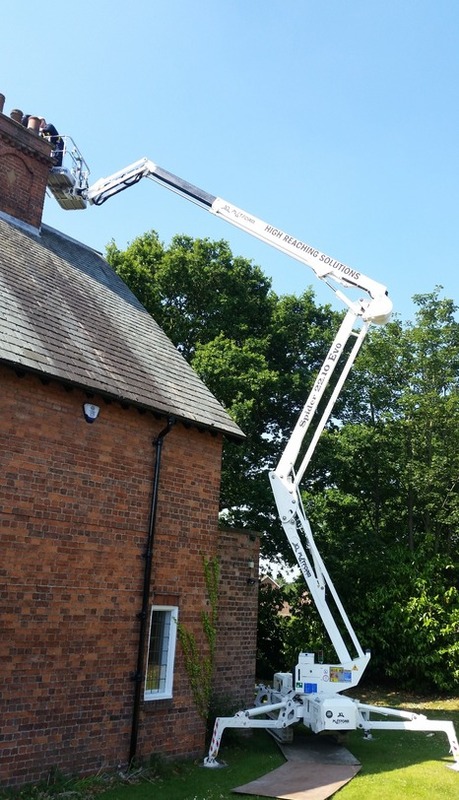 On the first property Selinas amazing outreach came into its own with Trevor Lund getting to where he needed to be to inspect the chimney for stability and condition. 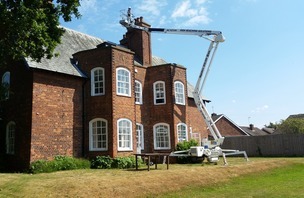 After the first stack had been inspected Selina was moved to the rear of the building so the second stack on the list could be reached. 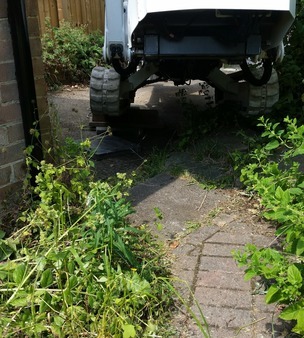 This involved Selina negotiating a deceptively steep grass bank, so having her tracks on wide setting for the additional ground clearance and stability and running on her Lithium batteries so as not to disturb the residence of the neighbouring properties, she was able to perform the task without issue (please watch the accompanying video). 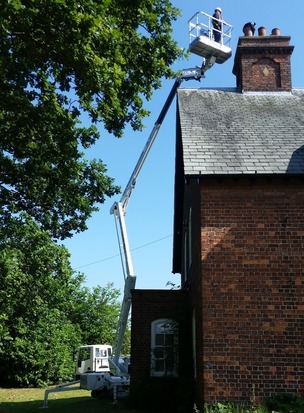 If you require an excellent chimney sweep in and around the York area then please get in touch with Trevor Lund on 01904 760075 or 07801 529952, I'm sure he'll be glad to hear from you. 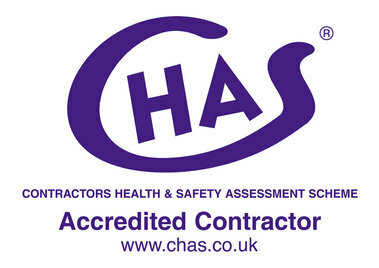 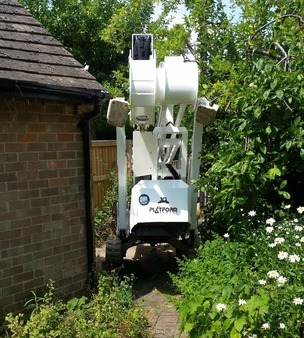 The second property in York we needed to inspect had the additional problem of an extremely difficult access situation. 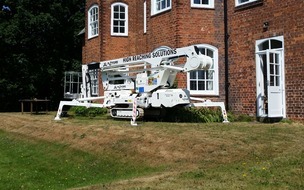 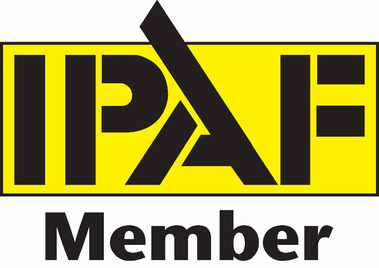 The property owners and our client had very strong doubts that anything other than scaffolding could solve their problem. 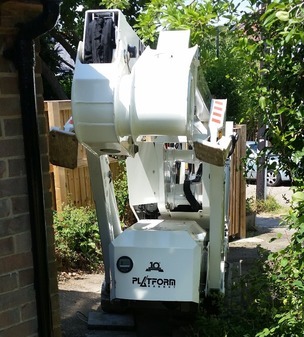 With a short, narrow and steep sloping driveway combined with a narrow gap to the side of the garage which included a small retaining wall, wasn't at all easy to negotiate. 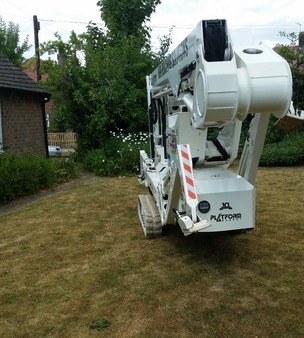 However, after a bit of thought, our experienced operator was able to put in place a method to overcome this particular problem. 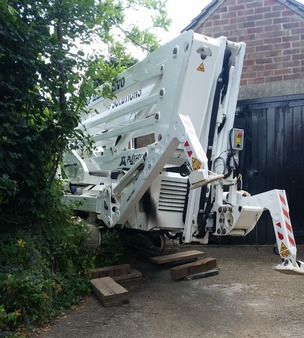 The accompanying photos shows what can be achieved with experience, knowledge of your machines capabilities, thought and careful operating. 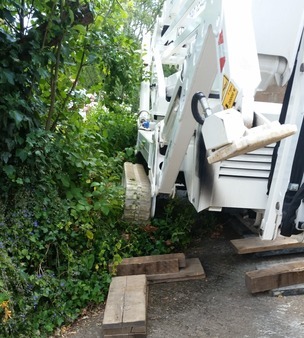 If you need Selina or one of her sisters to get into a tight or awkward space then please give High Reaching Solutions a call on 0845 313 8420 and we'll do our very best to assist you.